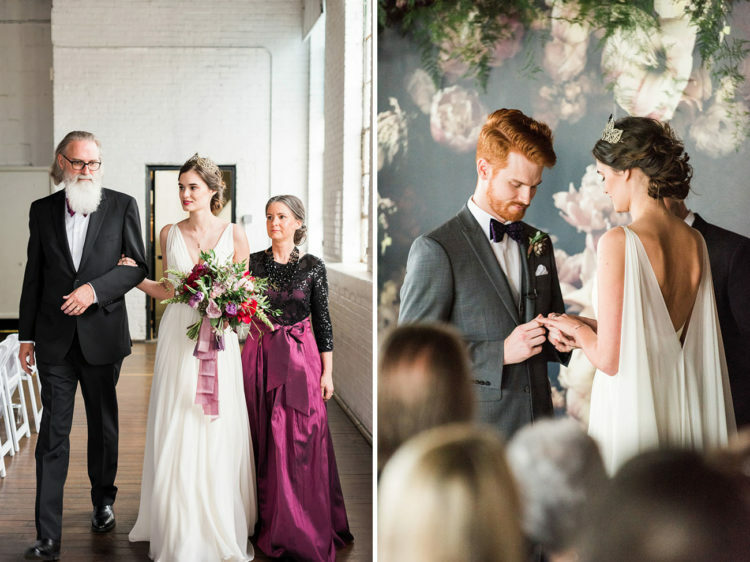 I don’t know how about you but I haven’t seen yet such an amazing and artfully wedding as this one! Every little piece of decor is so unique and picked up with a great taste. So I’m sure that these article and photos will inspire you and who knows maybe you will take some ideas for your big day! 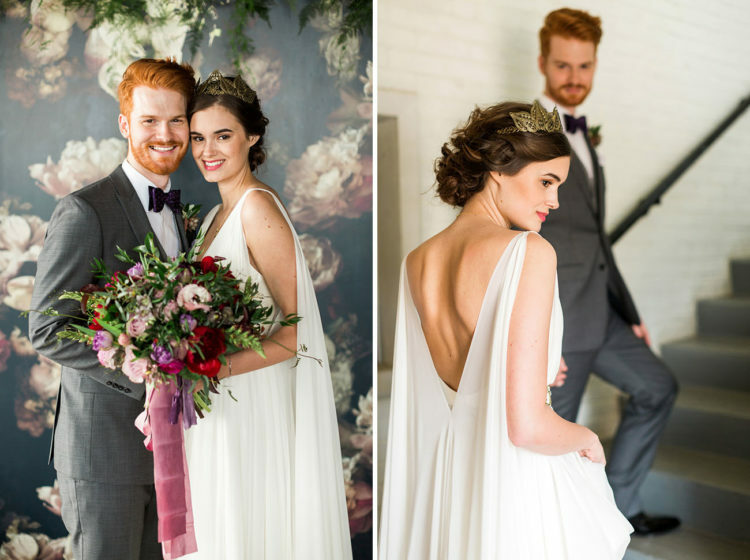 Let me introduce to you Rachel and Taylor, bride and groom, who made all stylish wedding ideas real and now we look at their wedding photos with a pleasure. 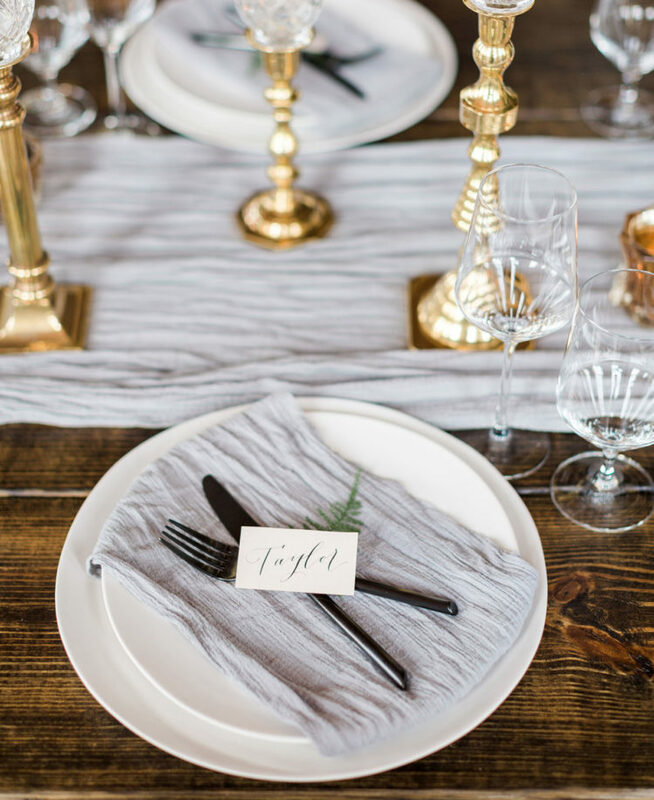 They chose Ambient + Studio in Atlanta, Georgia as a venue for their celebration. 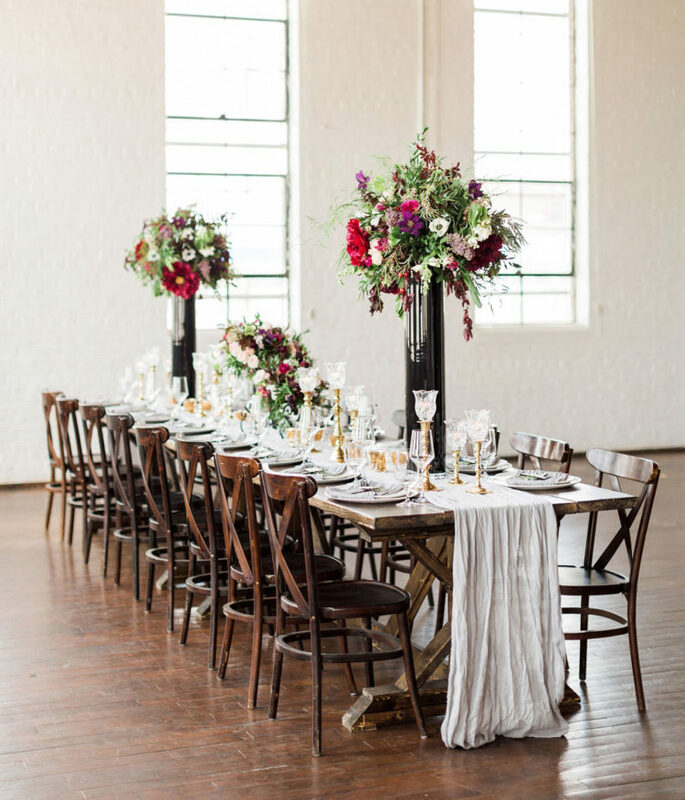 And it’s perfect place for this type of weddings, it has wood floors and storied white brick walls which are great as a base if you wanna add various decor elements and make this venue more special and touching. 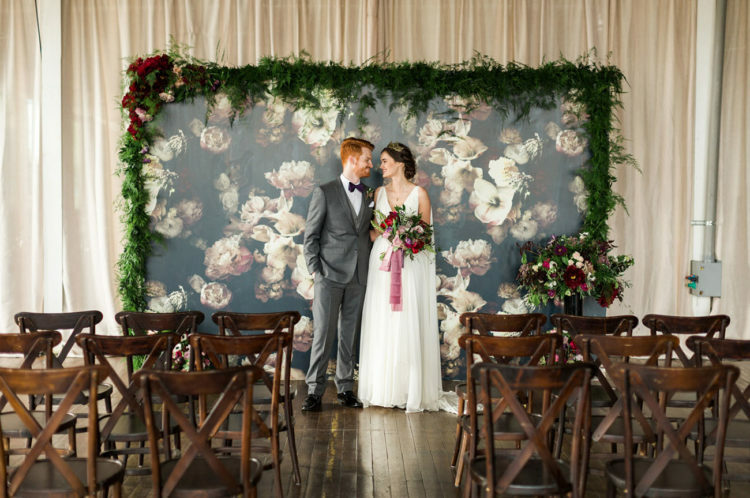 Rachel and Taylor were inspired by the dark floral wallpaper by artist Ashley Woodson Bailey. 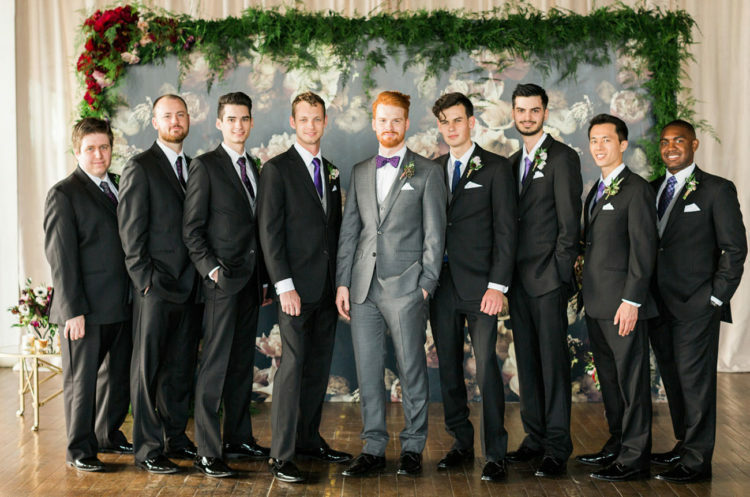 That’s why their wedding color palette was a mix of black, deep purple, marsala, gold and green. 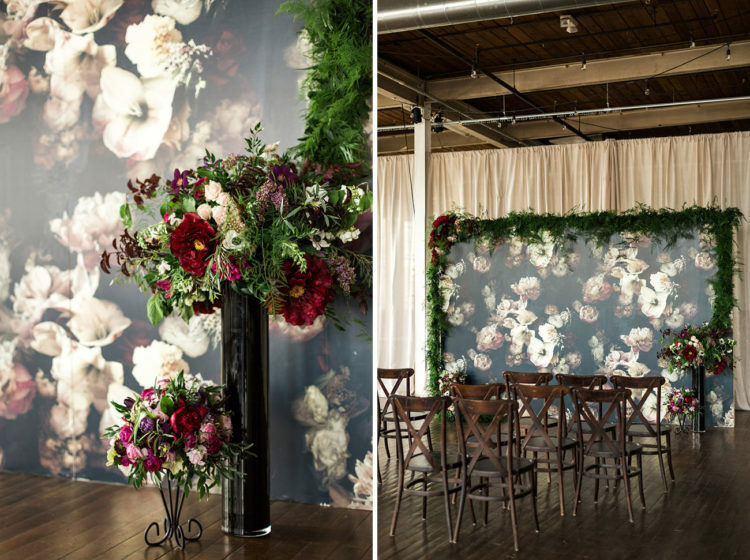 This wallpaper bride and groom used as a wedding backdrop for a ceremony and photo session of their couple and guests. 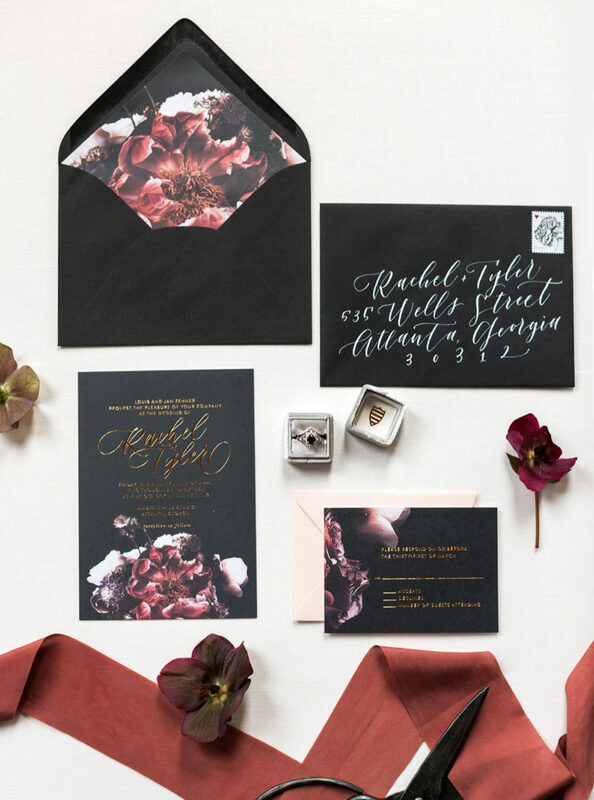 All invitations (and other paper goods) with black awesome envelopes were made by Ashley Buzzy Lettering + Press. 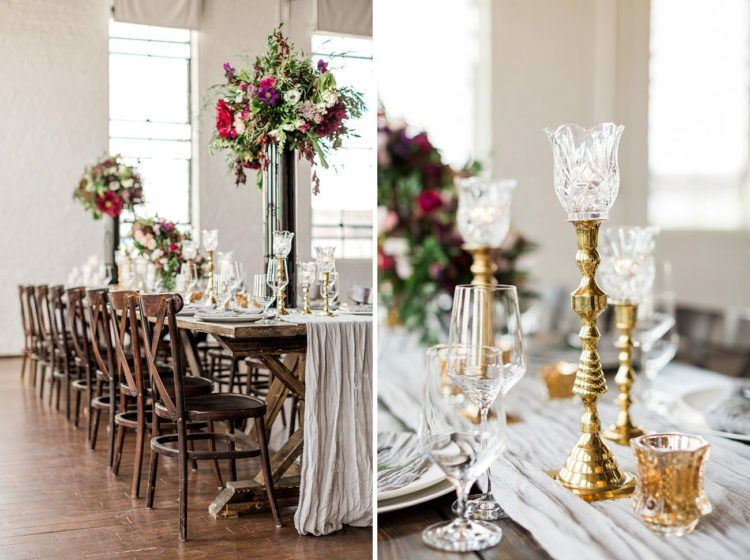 You can see floral decor details created by Flowers By Yona: gorgeous table centerpieces with many various flowers and greenery in unique vases, bright colored bridal and bridesmaids’ bouquets and floral decor elements for wedding cake. By the way I need to pay your attention to this fantastic adorable cake made by Sugar and Slate. 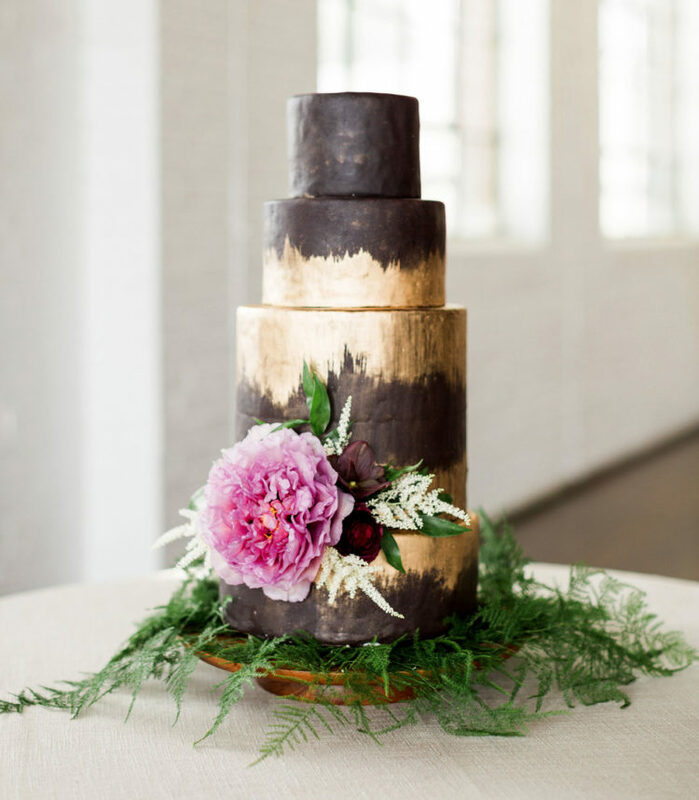 Rachel and Taylor chose four tiered black and gold cake decorated by greenery and big pink flower. 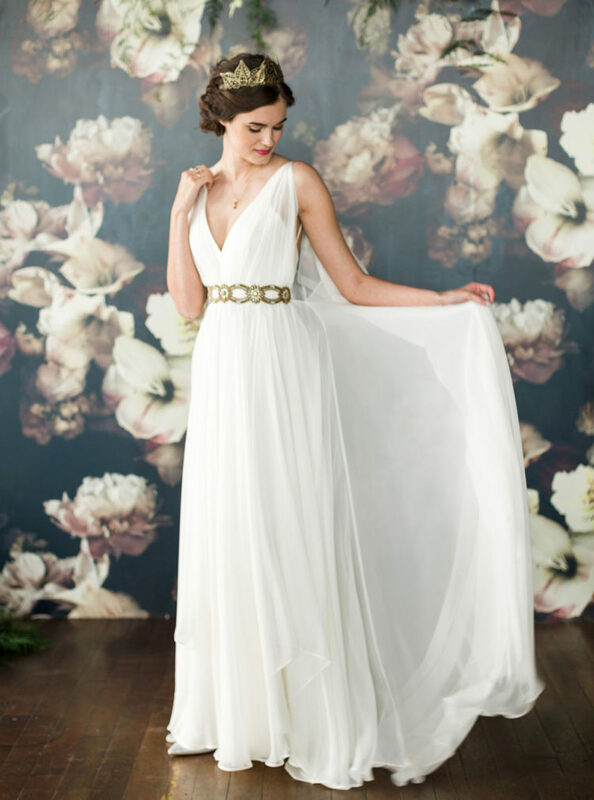 I haven’t words to describe bridal look cause it’s so stunning! Rachel wore white maxi dress in greek style with V neckline and golden belt from Custom Leanne Marshall and shoes from Calvin Klein. Beautiful golden crown from Pipstarpop supplemented her simple but chic hairstyle. Rachel looked like goddess for sure! 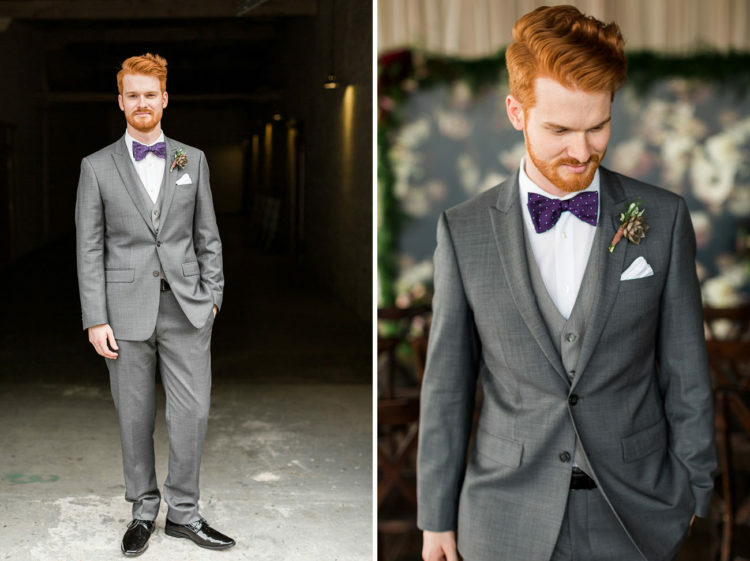 Taylor picked up classic gray suit from Calvin Klein too with little cool addition — purple polka dot bow tie. 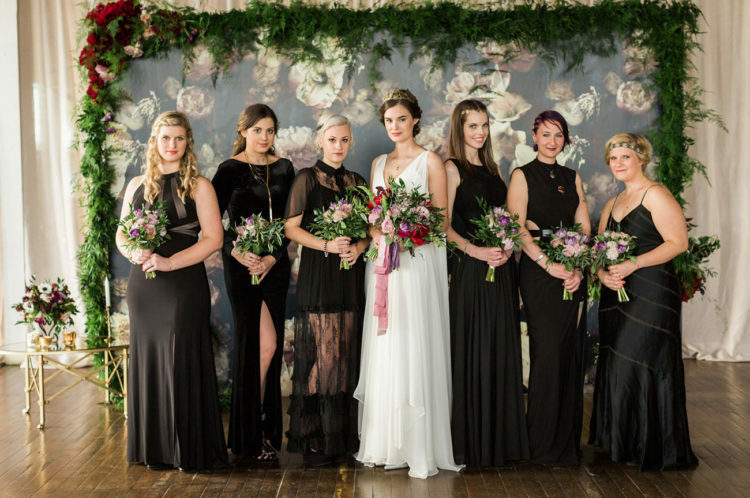 Rachel’s bridesmaids wore black maxi dresses of their choices, and groomsmen wore traditional black suits with floral boutonnieres. Now it’s time to enjoy moments of that day. 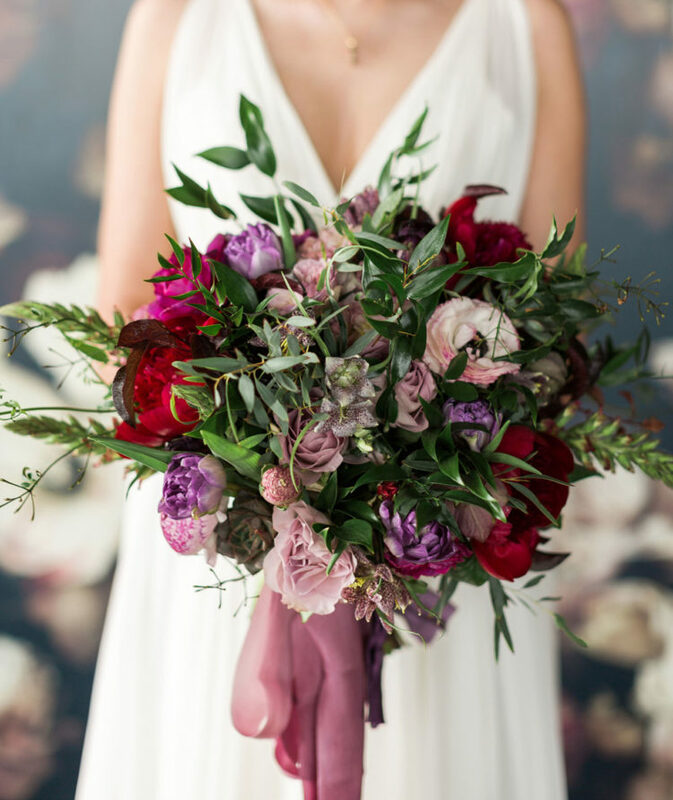 You can just scroll down to see all wedding photos which were taken by Rustic White Photography. Find your inspiration and be creative!